Michael Jackson’s posthumous album Xscape was just released Tuesday. It is an album of tracks, MJ recorded years ago, that producers “contemporized” to give the modern feel while retaining the Jackson-style. Antonio “L.A.” Reid, Timbaland, Rodney Jerkins, Stargate and J-Roc updated eight of Jackson’s completed tracks to form Xscape, released Tuesday. Produced by John McClain (co-executor of the Jackson estate “Love Never Felt So Good” was written in 1983 in a session with Paul Anka and Kathy Wakefield. In 1984, Johnny Mathis released a version. The latest rendition comes as the five-year anniversary of Jackson’s 2009 death approaches on June 25. One of the artist on the album is Memphis’ Justin Timberlake. A day after the album release, a video accompanying the track debuted on the Ellen Show. The video pays homage to Jackson as JT and the dancers lip-sync and dance to some iconic images from Jackson’s past videos? If you’ve heard it, how do you feel about the new album Xscape as a whole? 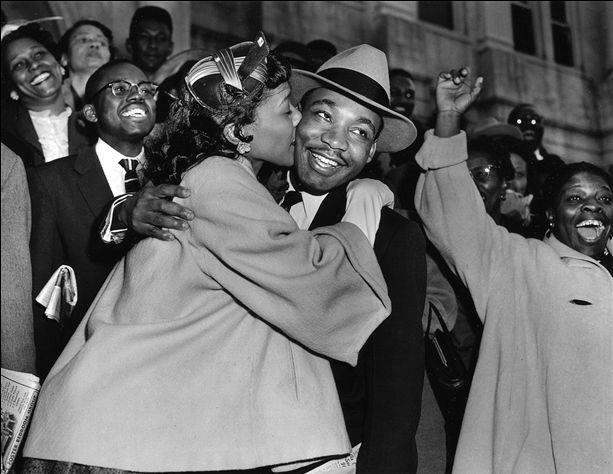 #ConversationStarter: King & The Civil Rights Era. As we celebrate Martin Luther King Jr., who would have been 83 yesterday, and the millions who fought for civil rights today’s #ConversationStarter is a simple one. What does Martin Luther King Jr. and what he and so many others marched for mean to you? Those who were alive do you any memorable moments from the Civil Rights Movement? So let’s reflect and start a conversation. Lastly, as we remember King, I want to leave readers with his last speech. I recently did a story for The Daily Helmsman on Sammie Burnett Johnson—the first of the Memphis State Eight to pass away. For those who don’t know the Memphis State Eight were the first African-Americans to integrate the classrooms of The University of Memphis (then Memphis State) in the fall of 1959. One of the first things I did in pursing this story was to contact individuals who knew Johnson during that initial integration period. I was able to track down the numbers of Bertha Mae Rogers and Marvis LaVerne Kneeland Jones. Neither were able to return my calls by deadline. However, Jones did return my call the day of publication. It was such a privilege to talk to her. We talked for a few minutes about her experiences during that time. How the eight couldn’t attend class together, weren’t allowed to take physical education or ROTC courses, and had to be off campus by noon. One of the interesting facts that she told me was she didn’t graduate until 1974. As she was about to graduate Memphis State told her she didn’t meet all the prerequisites for graduation because she had not taken physical education. Yet 15 years earlier she was told she could not take physical education so she told Memphis State that it had to waive that prerequisite. One thing she said did kind of shake me though. During our discussion she told me she was slightly bothered by the fact the individuals who fought for today’s generation of African Americans to walk the campus seem to forget how hard it was to get to this point. Jones was essentially saying my generation enjoys the luxuries of present without remembering the past. Now this was just causal conversation so perhaps she meant a particular sector of my generation—she certainly could not have meant all. Could she? I was taken aback and started wondering if others who fought for civil justice thought their accomplishments where done in vain. As I write this (on the 29th of January) it has been 4 days since that conversation and I am still shaken by it (and it takes a lot to shake a journalist). I do not want the people that came before me to think that my generation is not appreciative for all they have done. Yes, these individuals may not be acknowledged every day by name. Nevertheless, each is acknowledged in the actions of hundreds of thousands every single day. It is because of Sammie Burnett-Johnson, Marvis LaVerne Kneeland (Jones), Luther McClellan, John Simpson, Eleanor Gandy, Bertha Mae Rogers, and Rose Blakney that I am able to be called a Memphis Tiger. It is because of those eight I will graduate the University of Memphis with a degree in journalism. It is because of those eight that future generations (not just African-Americans, but Hispanics, Asians, etc.) would not be judged by the color of their skin but by the content of their character. I stand on the shoulders of the Memphis State Eight. I stand on the shoulders of those who paved the way for me. No, I may not know all of those individually who paved that way. No, I may not know their back-story. No, I may not know exactly what they did or why they did it. I do know though I stand on their shoulders and I am forever grateful to each one of them. I do know that if I am ever graced by their presence and have the opportunity to know their story I want to hear it. I do know that because they paved the way for me I can pave the way for someone else. Someone who will stand on my shoulders and accomplish great things. While I will say there may be some individuals who do live in solely the present without recognizing the past. I hope no one thinks our entire generation is enjoying luxuries without remembering the past because many African Americans I know, myself included, want to know their past. African American history courses would not exist if there was no yearning to learn about the African American journey—a journey so rich. When I brought the story of Sammie-Burnett Johnson to the table. My exact words were: “This story needs to be covered. It wouldn’t be right if it was not.” Johnson made history and it would be a shame if the very institution where she made that history did not acknowledge her. I wanted this story. I wanted to honor her. I have written “Standing On Your Shoulders” because I want anyone who has ever fought for what’s right to know that while you may not be acknowledged individually each day those who you broke down walls for have so much gratitude, respect, and love for you and acknowledge the strides that the past has made for the future. So much so that we can never forget what you have done. For if we forget what has been accomplished history is only bound to repeat itself. I like that statement, “Be ever so mindful of those who came before you and opened the doors of your success. Never forget the struggle, honor them in your actions.” What these trailblazers have done was not done in vain. Be it the Memphis State Eight, the Little Rock Nine, the millions who marched on Washington and so forth, future generations do not just honor the past by studying the past but by continuing break down walls and opening doors for the future. So to all of those who I stand on the shoulders of THANK YOU.